A leisurely walk to the station at Bewdley, with some swans seen on the river. 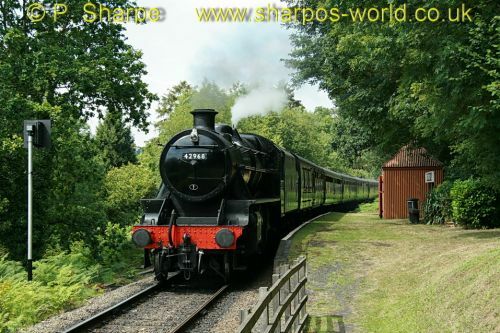 42968 hauled us to Arley for our sandwiches. 46443 was on the Driving Experience, crossing with D8059, which took us back to Bewdley. Time for another cuppa before we were on board the train behind D8059 again, heading for Northwood Halt. Eventually it was time to head back & D8059 was on or train as we headed for Bewdley, and home. This entry was posted in Sharpo's World Photo Updates on July 30, 2011 by Sharpo. A one-way journey to Bewdley for lunch, behind 7812. The next train from Kidderminster was hauled by 2857, and 43106 can be seen working the 3rd train. Margaret & family were heading for The Engine House, I returned home, by bus from Bewdley! Called in at Bewdley today, first two trains were chimney first, hauled by 5164 & 2857. Had to make my own way home but was able to wait for a later train to Kidderminster, hauled by 7812, which was tender first. This entry was posted in Sharpo's World Photo Updates on July 26, 2011 by Sharpo. The photos are already in my main gallery but spread over several years, so I have set up an album to display them all. The most recent ones were taken on 24th July. 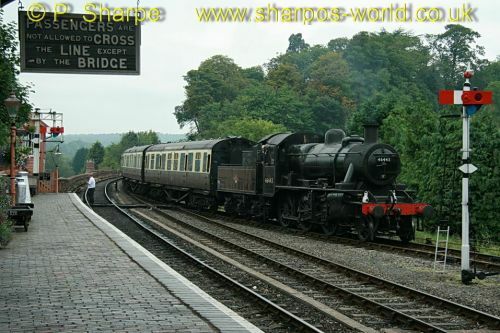 In the description box above the thumbnails you will find a couple of links, one is to a web site giving dates & times the ferry will operate and the other is to a satellite photo link of the local area, showing the Severn Valley Railway station & the ferry. This entry was posted in Sharpo's World Photo Updates on July 25, 2011 by Sharpo. Had our ride behind the 9F today. After stopping off at Arley for sandwiches, we continued our journey to Hampton Loade behind 92212, returning to Bewdley with it later in the afternoon. A much longer day for us than usual, but KC was with us so no need to rush home. 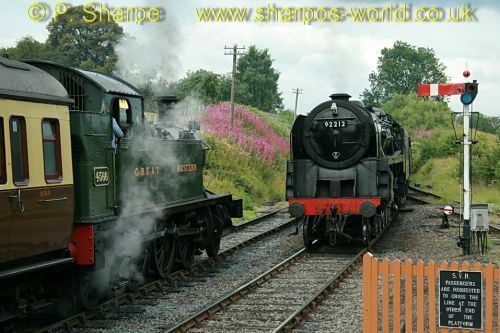 This entry was posted in Sharpo's World Photo Updates on July 24, 2011 by Sharpo. Bewdley to Arley & return for us. We did see some of the dance performers at Arley and the special, The Great Train Dance. Good to see 92212 running again, and the bonus for the day was the Red Arrows flying over Bewdley. 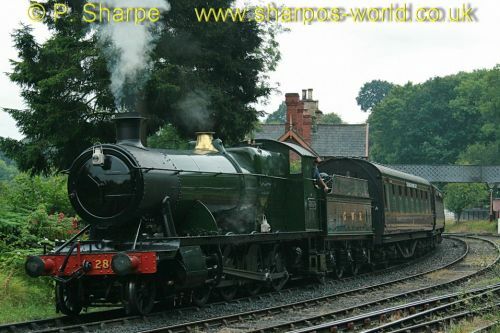 This entry was posted in Sharpo's World Photo Updates on July 23, 2011 by Sharpo. 2857 was double-heading with 4566 yesterday, but was on its own today with a 6-coach set. Late in the afternoon I headed to Bewdley for a ride to Highley behind it, catching the last train of the day back from Highley. 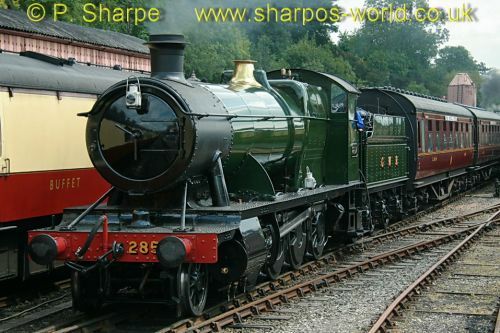 This entry was posted in Sharpo's World Photo Updates on July 22, 2011 by Sharpo. I didn’t bother photographing 4566 or 43106, but couldn’t resist 42968 when I saw it approaching with an “L” plate on the bufferbeam. This entry was posted in Sharpo's World Photo Updates on July 19, 2011 by Sharpo. What a month! Jobs to do in the garden, a faulty camera lens, a big bill from the garage to get the car through the MOT test (but there’s a story to that!) I could do with a break!! I’m sure I’ve missed some photos somewhere. Every winter I think I’ll catch up with everything – but it never happens. Oh well, tomorrow is another day……. This entry was posted in My uninteresting stuff on July 17, 2011 by Sharpo. 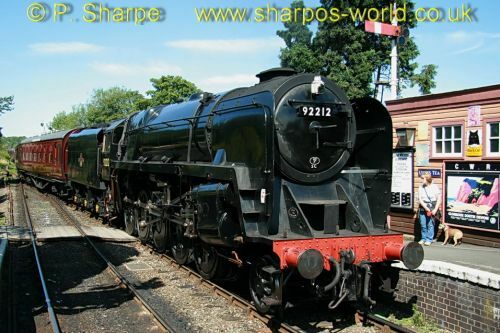 This was the first service train to be hauled by the 9F since arriving at the SVR, on loan from the Mid Hants Railway. 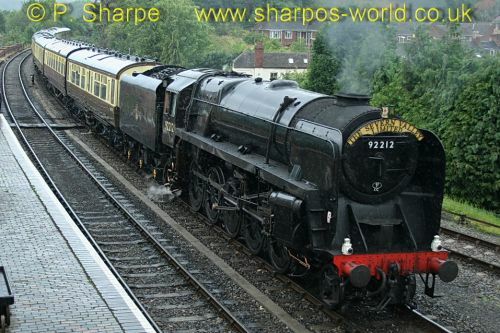 The weather forecast was poor & sure enough, when 92212 approached chimney-first, the rain started! D821 was on a Diesel Driving Experience and 5164, 42968 & 43106 were working the other trains. The rain doesn’t show in this smaller photo…. 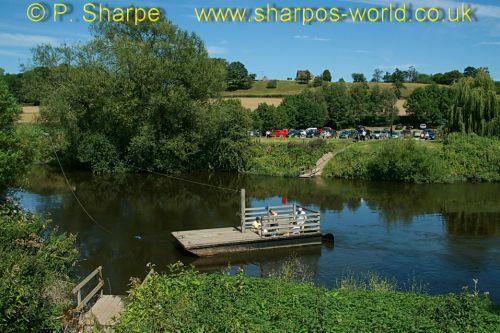 This entry was posted in Sharpo's World Photo Updates on July 17, 2011 by Sharpo. It was the SVR 1940s Weekend and a fly-past was expected over the Railway. Finding a suitable spot with the sun behind me, I waited for a ‘plane to appear. Originally, three ‘planes were listed as appearing, but on the day there was only the one, but it did fly over twice. 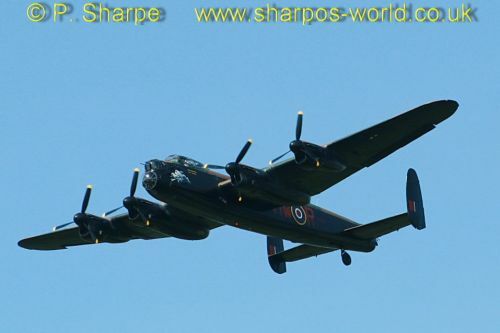 In previous years with the smaller ‘planes, they seemed to be gone within seconds, but the Lancaster seemed to be flying much slower and it was easier to photograph. Unfortunately, much of the underside of the ‘plane is in shadow, but I am pleased with the photos. Where is the time going to? The weeks are going by & I’m getting further behind! Sometimes I can’t be bothered to take photos, then I see the loco has a headboard & out comes the camera! 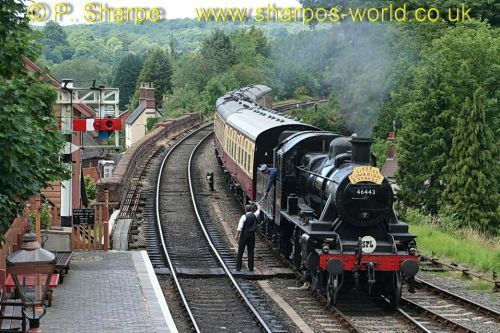 46443 was seen on one of the trains at Bewdley & 5164 on the other.